We have been providing Southern California (in particular the Los Angeles, Orange County and the San Fernando Valley) quality kosher fusion food and catering services for over 15 years. Our qualified event architects can provide every service you may need for a memorable event, from limos to linen, flowers to fiddlers. We can design and/or customize an event just for you, your budget and your needs and goals. We provide full planning and coordination, from start to finish, no matter how simple or complicated. 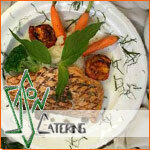 Sason Catering offers a wide selection of unique menus to accommodate all types of functions. Our consistent quality of food is second to none. We have built a reputation on providing the finest quality foods, tastefully prepared by our Executive Chef and creatively designed and presented by our professional staff. Our daily focus is on attention to detail for the specialized needs of our clients. Get more for your wedding! Don't forget to mention ChossonKallah.com when visiting Sason Catering.